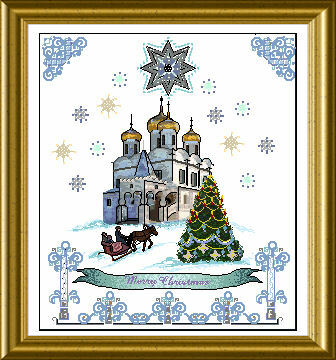 This is a true Winter’s piece – sparkly, cold, icy – the beautiful image of a Russian church with the typical onion domes. A sparkling and ornamented Christmas Tree in the foreground, a sleigh with horses dashing by… stylisized stars in the skies… ornaments in the corners and as a fence-like border at the bottom – you have it all. You can add Christmas greetings in several languages to your taste . For the stitching we use diverse threads, silks, metallic braids as well as beads and crystals for the real sparkle ! Together with normal cross stitches you embroider Special Stitches for lovely effects.